Your arteries are normally smooth and unobstructed on the inside, but as you age, cholesterol plaque can build up in the walls of your arteries. Plaque is made up of cholesterol, calcium, and fibrous tissue. As more plaque builds up, your arteries narrow and stiffen. This process is called atherosclerosis, or hardening of the arteries. Eventually, when enough plaque builds up to reduce blood flow through your carotid arteries, physicians call this carotid artery disease. Carotid artery disease is a serious health problem because it can cause a stroke or cerebrovascular incident. Some plaque deposits are soft and are prone to cracking or forming roughened, irregular areas inside the artery. If this happens, your body will respond as if you were injured and flood the cracked and irregular area with cells called platelets. A large blood clot may then form in your carotid artery or one of its branches. 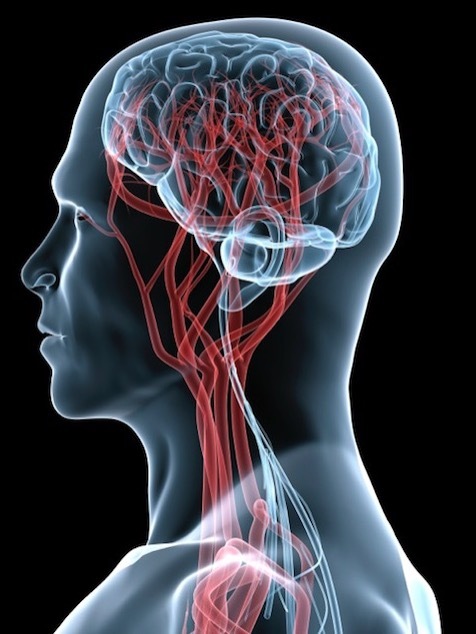 If the clot blocks the artery enough to slow or stop blood and oxygen flow to your brain, it could cause a stroke. More commonly, a piece of the plaque itself, or a clot, breaks off from the plaque deposit and travels through your bloodstream. This particle can then lodge in a smaller artery in your brain and cause a stroke by blocking the artery. Hardening of the arteries causes most cases of carotid artery disease. Experts do not fully understand the cause of hardening of the arteries. Plaque may build up in the arteries because of an injury to the artery's inner lining. Factors that injure artery walls include smoking, high cholesterol and high blood pressure. In rare cases, conditions known as carotid aneurysm disease and fibro-muscular dysplasia cause carotid artery disease. First your physician asks you questions about your general health, medical history and symptoms. In addition, your physician conducts a physical exam. Together these are known as a patient history and exam. As part of your history and exam, your physician will ask you if you smoke or have high blood pressure. Your physician will also want to know when your symptoms occur and how often. After the history and exam, if your physician suspects you have carotid artery disease, he will perform a carotid duplex ultrasound. In this test, a technician holds a small ultrasound probe to your neck. The probe emits high-frequency sound waves that bounce off of blood cells and blood vessels to show blood flow and problems with the structure of blood vessels. This test can show your physician how open your carotid arteries are and how quickly blood flows through them. 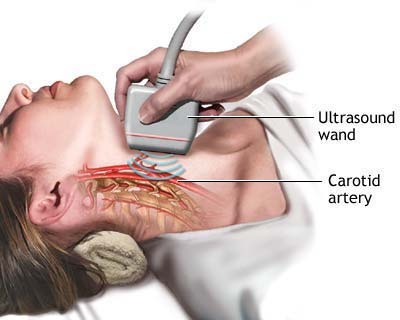 Carotid duplex ultrasound detects most cases of carotid artery disease. Therefore, your physician may not need to perform other tests. Your treatment will depend on the severity of your condition, as well as your general health. As a first step, your vascular surgeon may recommend medications and the lifestyle changes discussed later in this article. If you have any other medical conditions, make sure to follow your physician's instructions to manage them. For example, if you have diabetes, be sure to monitor and control your blood sugar levels. If you have high blood pressure, your physician may prescribe medications to lower it. Have your physician check your cholesterol levels regularly to be sure they stay within normal limits. Your physician may prescribe medications such as statins to reduce high cholesterol. You may require surgery if your carotid artery disease is severe or has progressed. Signs of severe disease include having TIA symptoms, having experienced a stroke in the past, or just having a severely narrowed carotid artery (>90% stenosis) even without symptoms. During surgery, Dr Weir removes plaque that is blocking your carotid artery. The procedure is called a carotid endarterectomy. Dr Weir makes an incision in your neck and then removes the plaque contained in the inner lining of your carotid artery. This procedure removes the plaque and leaves a smooth, wide-open artery. You may be able to leave the hospital a day or two after the procedure depending upon how you feel. This procedure is safe and long lasting. Angioplasty and stenting is a minimally invasive procedure to treat carotid artery disease. To perform this procedure, a vascular surgeon may insert a long, thin tube called a catheter through a small puncture site over a groin artery and guide it through the blood vessels to the carotid artery. The catheter carries a tiny balloon that inflates and deflates, flattening the plaque against the walls of the artery. Next, the physician places a tiny metal-mesh tube called a stent in the artery to hold it open. Hospital stay after angioplasty and stenting is approximately the same as with endarterectomy. Carotid angioplasty and stenting is highly controversial because long-term results are not as good as with surgery. 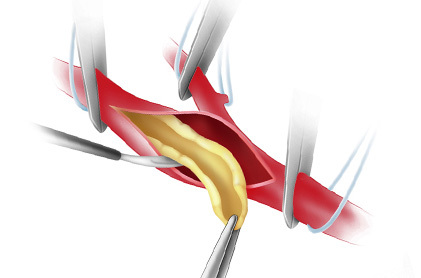 Nevertheless, for patients who have medical conditions that increase the risk of carotid endarterectomy, angioplasty and stenting may be an alternative. If you do not require surgery, make sure you and your immediate family members understand the warning signs of TIA. Follow Dr Weir’s instructions for any prescribed medications, and return for any scheduled follow up tests. Changing some lifestyle factors, especially smoking, may limit the progression of your carotid artery disease. The first step smokers should take is to quit smoking. Other changes that can decrease your risk of carotid artery disease include losing weight, exercising regularly, and eating a diet low in saturated fats.